- download a report on the visit. 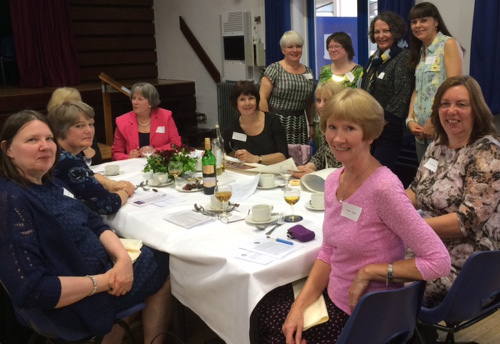 On Saturday September 18th , 58 Old Girls gathered in the Oldfield Hall at King Charles 1 School. After enjoying meeting up over tea and coffee, the AGM opened at 11 a.m.
- Rosemarie Morgan was re-elected as Chairman, and Anne Budworth as Vice Chairman. - Events of the last year were reported , particularly the Confessions of a Pantomime Dame evening. - An updated constitution was presented to the AGM and adopted unanimously. - Thanks were given to Rosemarie Moore and Elisabeth Robinson for their work with the Flower Fund, to Margaret Bazley as Treasurer, to all of the Committee for their work throughout the year, with particular thanks to Anne Budworth for all her hard work as Newsletter editor and vice Chairman. Alison Hargreaves was also thanked for her committee membership , as she is stepping down from the committee at the moment due to other commitments. After a delicious lunch, members were treated to an informative talk by Alice Bennett on her visit to Buckingham Palace for her investiture as an M.B.E. Please note that from 1st September 2016 subscriptions will be £5 (non internet members) and £10 (for overseas non internet members ); life internet membership to be increased to £25, and so standing orders will need to be amended accordingly. Confessions of a pantomime dame. As members of the O.G.A. and their guests gathered in the Science Theatre, we began to wonder. We had been promised an evening with a pantomime dame, and yet, standing in front of us, was a smartly suited gentleman introducing himself as Richard Westcott. We were not to be disappointed, though, for step at a time he transformed himself into a typically outrageous pantomime dame, complete with an engaging and hilarious commentary. Quite how many members take up the tips on make up, or indeed costume design and choice remains to be seen! We were also treated into insights into the magical world of pantomime, from the other side of the stage. Not the least of these was the necessity for quick costume changes at times. Whilst `tricks of the trade` can make this process easier - who would have thought of attaching one`s hat to one`s wig? - the assistance of a dresser is still invaluable, and Richard, as is his custom, chose someone from the audience for this role - me! Nothing had prepared me for this stressful and onerous task, not made any easier by Richard`s constant asides, which provided much added amusement for the assembled company! After looking at a further selection of costumes and accessories that only a panto dame could love, our evening drew to a close in a traditional manner, with audience participation in a pantomime song. In true K.H.S. tradition it was enthusiastic, if not exactly of Madrigal choir standard in other respects. Over light refreshments it was evident that everyone had thoroughly enjoyed the evening, and our thanks go to all involved with the arrangements for the evening, which made a small profit for O.G.A. funds as well. On Saturday September 19th, 44 Old Girls gathered at The Wagon Wheel at Grimley. After enjoying meeting up over tea and coffee, the AGM opened at 11 a.m.
Rosemarie Morgan was re-elected as Chairman, and Anne Budworth as Vice Chairman. events of the last year were reported, particularly the Centenary Lunch on April 18th 2015. 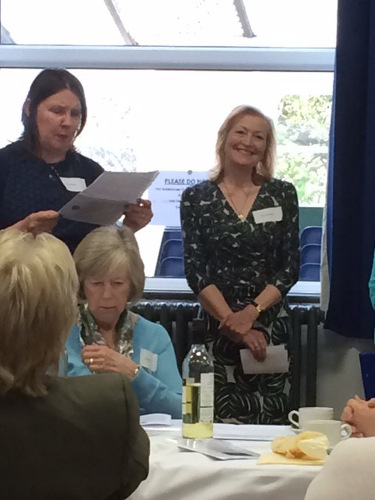 Thanks were given to Rosemarie Moore and Elisabeth Robinson for their work with the Flower Fund, to Margaret Bazley as Treasurer, to Alison Hargreaves for her work as Webmistress, and all of the Committee for their work throughout the year. Alice Bennett was congratulated on her recent award of the M.B.E. 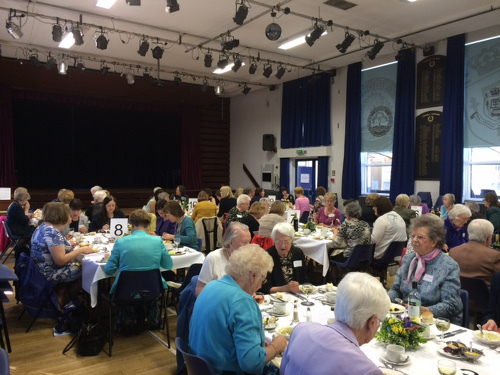 After a delicious lunch, members were greatly entertained by Mary Wehner, Judy Neale and Margaret Bazley, who regaled us with memories of their recent visit to the Buckingham Palace Garden Party to celebrate the centenary of the W.I. The O.G.A. was formed in December 1914 , as a knitting group to provide garments for servicemen in World War I . Therefore, the centenary of the OGA was in December 1914 . As this was not such a practical time to commemorate the occasion, a lunch was arranged for April 18th 2015. 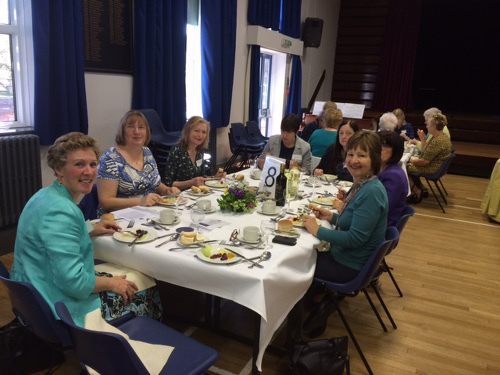 87 Old Girls gathered in the familiar surroundings of the Oldfield Hall for the Centenary Lunch. A superb lunch gave plenty of opportunity for catching up with old friends. The tables had been decorated in the house colours by Monica Bashford and Elisabeth Robinson. 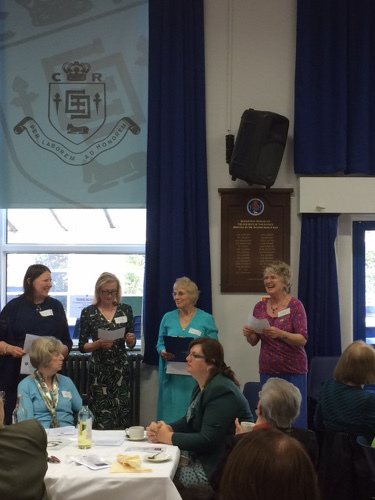 Lunch was followed by the reading of extracts from the 50th Anniversary magazine by members of the committee, and the afternoon concluded with the singing of the school song , accompanied by Rosemarie Morgan, and three cheers for K.H.S. , led by Monica Bashford. Each member was presented with a special commemorative leather coaster in blue and gold and a laminated copy of the school song as momentoes of the occasion. This year`s AGM and lunch saw several changes for the OGA, the first of which was the venue. The closure of The Hundred House at Great Witley meant that a new venue had to be found. The Wagon Wheel at Grimley was highly recommended by members of the committee who had enjoyed visits there through the W.I. , and we were certainly not disappointed. Although the meeting area did present some difficulties, the management are keen to help us overcome these for next year. As she had indicated at last year`s AGM, Miss Bedford did not stand for re-election as Chairman. She did so after 37 years of "looking after the Old Girls" at Miss Renwick’s request. Miss Bedford was warmly thanked for all her work for the OGA, and was given flowers, a card signed by all present , and an initial gift of a donation for Disability Action Wyre Forest, a charity she is closely involved with. This meant the election of a new Chairman, and Rosemarie Morgan (nee Pitt) was duly elected, with Anne Budworth (nee Amies) elected as Vice Chairman. Shirley Whiteside did not seek re-election as Treasurer after carrying out this role for several years, and we are grateful to Margaret Bazley for taking on this role for the OGA. Shirley was also presented with flowers, and a garden gift voucher in thanks for all her hard work. The next event for the OGA will be the Centenary Lunch in the Oldfield Hall at school to celebrate the centenary of the formation of the OGA in December 2014. The lunch is on Saturday April 18th. Event sadly postponed due to a fall. Miss Stoker has broken her hip and her party will be held asap. Revised dates will be shown here and on Facebook. If you would like further information, please use the link. You are invited to celebrate the 100th birthday of Mrs Hudson (nee Stoker) - KHS staff 1947-1973 - on Saturday 10th May at 3pm in the Science Theatre at King Charles I School Comberton Road Kidderminster( KHS site). Afternoon tea provided . Cost is £5 per person , but it is vital that you book in advance, please, so that we know numbers!! R.S.V.P. to Miss Bedford please by Saturday 26th April. We had a really `enjoyable and informative` tour of Kidderminster’s Museum of Carpet Museum Green Street (which adjoins Morrisons). Around 40 members and friends came to see this beautiful and relevant museum which is an homage to Kidderminster`s heritage. It is a bright, modern place with informed and enthusiastic volunteers (some of whom are ex-KHS) who made us very welcome. After refreshments and a very interesting background talk on the history of Kidderminster we learnt why and how the carpet industry evolved there. Many of us found it very reminiscent of our `Geography Field Trips` when we toured Brintons with Mrs Crossland many years ago. We went onto the `shop floor` and had a masterclass from two very experienced Wilton and Axminster weavers and were lucky enough to see both looms in action. We looked at the many and varied displays and aids including interactive `carpet colouring` and visited the gift shop. Many thanks to Miss Bedford for organizing it and to the museum staff and volunteers. It was a lovely afternoon. At the 2013 AGM, Miss Bedford gave notice that she would be stepping down as chairman at the 2014 AGM. Rosemarie Morgan was elected as Vice Chairman for 2013/14 and the position of Chairman will be on the agenda at the 2014 AGM. Miss Bedford has been the cornerstone of the OGA for well over 20 years. She has worked tirelessly and has done a really wonderful job of keeping the memory and network of KHS alive. We hope she will stay on the committee. At the 2013 AGM, Miss Bedford gave notice that she would be stepping down as chairman at the 2014 AGM, and Rosemarie Morgan was elected as Vice Chairman for 2013 /14. The following booklets by Mrs Jo Roche are available. They are available from Beryl Bedford, 80, Holmcroft Road, Kidderminster DY10 3QG. Stephanie Bidmead as Hippolyta, seen front stage left (as you look at it) She was in good company. 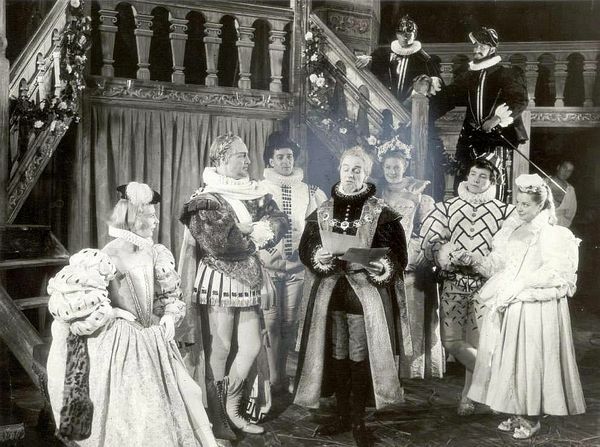 Cast included Vanessa Redgrave as Helena -seen at back, tallest lady. Also listed :Charles Laughton as Bottom, Robert Hardy as Oberon, Ian Hol as Puck, plus Roy Dortice, Albert Finney, Cyril Luckham, Julian Glover. It is poignant to think what heights Stephanie would have reached had she not been struck down by illness at an early age. We will be celebrating our centenary on Sat 6th October 2012 with a service at St Mary's church at 2pm which we hope to fill to the aisles! Other suggestions for the day include a tour of the school with refreshments and possibly evening get-togethers organised in yeargroups. Let us have your suggestions and organise your own events. Several Old Girls live in New Zealand, and Sheila Kirk has forwarded two emails. LUDLOW Festival has honoured its former Shakespeare production wardrobe manager (Sheila Kirk) with a life membership of the festival's friends association and a floral presentation.